Reactive powder concrete (RPC) stands for the generic name for a class of cementious composite materials which contain superior physical properties, specifically ultra high strength and ductility. It is formed by mixing fiber reinforced, super plasticized silica fume, cement and quartz sand along with very low water cement ratio. It contains greater compressive strength since quartz sand is applied in place of ordinary aggregate. Composition of RPC: RPC attains it’s superior properties with a very solid mix containing fine particles and fibers. It is cured in steam bath for 48 hours @ 190 degree F (88 degree C) as soon as it is set primarily. It is set under pressure at the molding phase. 1. Greater compressive strength as compared to HPC. 2. It is a factor connected with stability of material. 3. Highest compressive strength of RPC is roughly 200 MPa. Flexural Strength: Plane RPC comprises of extreme flexural strength as compared to HPC (up to 100 mpa). With steel fibers, RPC can attain extreme flexural strength. Water Absorption: The ratio of water absorption or RPC is very low than HPC. This feature of RPC supports the desired properties of nuclear waste containment materials. Water penetrability: Water penetrability is reduced in due course of time for all mixtures. 28th day penetrability of RPC is minor than HPC (almost 7 times lower). 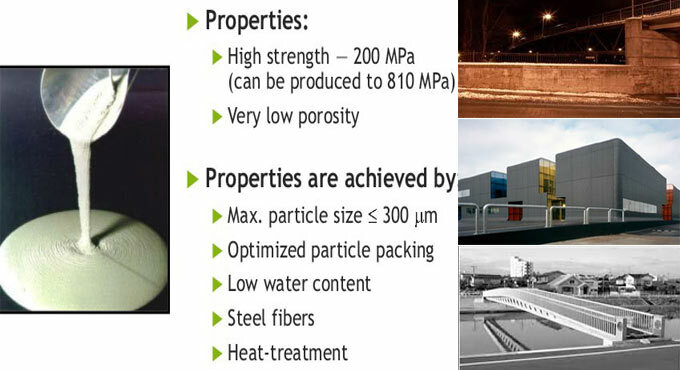 For water absorption, the application of fibres enhance the penetrability of both types of concrete. Defiance to chloride ion penetration: It is raised if heat curing is accomplished in concrete. Heat cured RPC demonstrates higher value as compared to normal cured RPC. This characteristic of RPC makes it perfectly fit for being used in nuclear waste containment structures. Homogeneity: It is enhanced by removing all coarse aggregates. Dry components to be applied in RPC remains under 600 micro meter. Compactness: Application of pressure prior to and throughout concrete setting period. Microstructure: Microstructure of the cement hydrate is altered by providing heat treatment throughout curing. Material Ductility: Material ductility is enhanced through the inclusion of short steel fibres. 1. It has the ability to structurally combat with steel. 2. It has greater stability along with shear capacity that leads to substantial dead load curtailment. 3. RPC is utilized to withstand all but direct primary tensile stress. 4. Superior seismic performance by eliminating inertia load with lighter member. 5. Low and non-interconnected porosity reduces mass transfer, keeping penetration of liquid/gas non-existent.